American Air Astro Cell Commercial HEPA Filters are used in filter applications for hospitals, data centers, nuclear facilities, pharmaceuticals, laboratories, aerospace, food processing and optics. 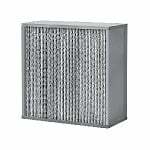 The Commercial HEPA Filter Replacement 23.3" x 11.3" x 11.5" High Capacity is the correct replacement for the American Air Filter AstroCel I filter. The Commercial HEPA Filter Replacement 23.3" x 11.3" x 11.5" Standard Capacity is the correct replacement for the American Air AstroCel SC. The Commercial HEPA Filter Replacement 23-3/8" x 23-3/8" x 11-1/2" High Capacity is the correct replacement for the American Air AstroCel 2424115. The Commercial HEPA Filter Replacement 23-3/8" x 23-3/8" x 11-1/2" Standard Capacity is the correct replacement for the AstroCel 2424115 SC. The Commercial HEPA Filter Replacement 24"x12"x11.5" High Capacity is the correct replacement for the American Air Aerostar 11420 HC. The Commercial HEPA Filter Replacement 24"x24"x11.5" Standard Capacity is the correct replacement for the American Air Astro Cel 550-205-005. The Commercial HEPA Filter Replacement 24"x24"x11.5"High Capacity is the correct compatible replacement for the AstroCel 550-265-005. The Commercial HEPA Filter Replacement 24"x24"x11.5" Standard Capacity is the correct replacement for the American Air AstroCel 550-265-005 SC. The Commercial HEPA Filter Replacement 23-3/8" x 11-3/8" x 11-1/2" High Capacity is the correct replacement for the American Air AstroCel 550-265-004 HC. The Commercial HEPA Filter Replacement 23-3/8" x 11-3/8" x 11-1/2" Standard Capacity is the correct replacement for the AstroCel 550-265-004 HC. The Commercial HEPA Filter Replacement 23-3/8" x 23-3/8" x 11-1/2" High Capacity is the correct replacement for the American Air Astro Cell 550-265-005 HC. The Commercial HEPA Filter Replacement 23-3/8" x 23-3/8" x 11-1/2" Standard Capacity is the correct replacement for the American Air Filter Astro Cell 557-265-305 SC. The Commercial HEPA Filter Replacement 24"x24"x11.5" High Capacity is the correct replacement for the American Air Astro Cell 557-265-305 HC. The Commercial HEPA Filter Replacement 24"x24"x11.5" Standard Capacity is the correct replacement for the American Air Astro Cell 557-295-304 SC. The Commercial HEPA Filter Replacement 24"x24"x11.5" High Capacity is the correct replacement for the American Air AstroCel 557-205-405 HC. The Commercial HEPA Filter Replacement 24"x24"x11.5" Standard Capacity is the correct replacement for the American Air AstroCel 557-205-405 SC.